(Nanowerk News) Nanodiamonds are tiny crystals only a few nanometres in size. While they possess the crystalline structure of diamonds, their properties diverge considerably from those of their big brothers, because their surfaces play a dominant role in comparison to their extremely small volumes. Suspended in aqueous solutions, they could function as taxis for active substances in biomedical applications, for example, or be used as catalysts for splitting water. But how are the electronic properties of nanodiamonds deposited on a solid-state substrate different from those displayed by nanodiamonds in aqueous solutions? Dr. Tristan Petit working in the HZB team headed by Prof. Emad F. Aziz has now investigated this with the help of absorption and emission spectroscopy at BESSY II. Their results, just published in Nanoscale ("Valence holes observed in nanodiamonds dispersed in water"), demonstrate that nanodiamonds display valence holes in aqueous solutions, which are not observed when characterized as a thin film. “The interaction between the nanodiamonds and the neighbouring molecules and ions is especially strong in water”, say Petit. The adsorption of active pharmaceutical ingredients on nanodiamonds can be influenced, for example, by adding salts or changing the pH value. Petit and his colleagues have now discovered that the electronic signature of surface states of nanodiamonds in aqueous dispersions are considerably different from those of nanodiamonds on a solid-state substrate. With the help of micro-jet technology developed by Emad Aziz at HZB, they examined liquid samples in vacuum using X-ray spectroscopy and developed a detailed picture of the filled and unfilled electron states in valence and conduction bands. Their results show that holes, i.e. missing electrons in the valence band, formed on the surfaces of the nanodiamonds in the aqueous dispersion. “This suggests that electrons at the surface of nanodiamonds are donated to the surrounding water molecules”, Petit suggests. 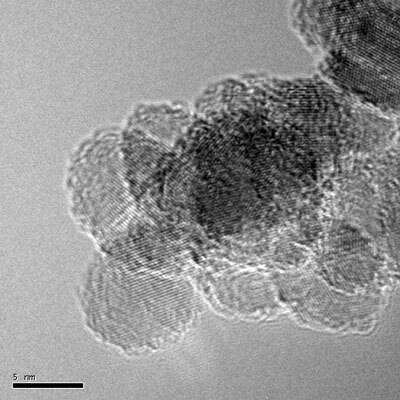 The physicists suspect they might also influence the nanoparticles’ chemical, optical, and catalytic properties through changes to their electronic structure. They would like to determine in future studies whether the catalytic effect of nanodiamonds in aqueous environment can be increased in order to split water molecules into oxygen and hydrogen using light.